Pre-orders for the Samsung Galaxy Note 3 on Verizon and AT&T are now open starting at $299 for the phone with a new contract. AT&T expects pre-orders to begin shipping by October 1, while Verizon is showing a “ship by” date of October 10. If you’d like to buy the phone at full retail and not sign-up for a new contract, Verizon is selling the Note 3 for $699, while AT&T has upped the price further to $725. If you don’t want to go the full retail or on-contract routes, you can always buy using either carrier’s monthly-payment plan. Verizon Edge has the phone at $29.16 per month with $0 down – AT&T Next shows a $35 per month payment, also with $0 down. 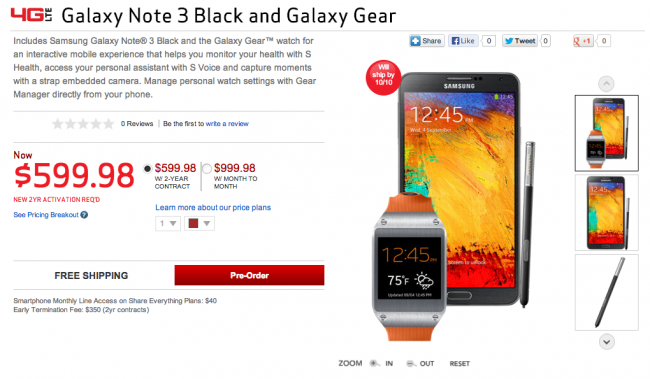 If you want the Galaxy Gear along with your new Note 3, Verizon is already offering a bundled set with the two that runs $599 ($299 for the phone, $299 for the watch) if you sign a contract for your Note 3. If you go full retail, you’ll pay $1000. AT&T would only say that the Galaxy Gear is to arrive in the coming weeks. I’m not actually seeing any way for you to buy the Galaxy Gear as a stand-alone product, which is unfortunate.